This content is part of the Winter 2019 Beacon Magazine: The Resolve Issue. Read more from the issue. Achieving success means tracking your progress, being flexible, being willing to revise goals, and rewarding yourself when you are successful. Remember, preparing meals at home is healthier and less expensive than ordering takeout, eating in a restaurant, or buying some brands of frozen dinners. 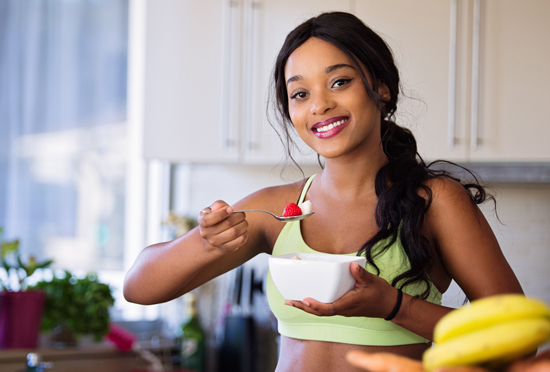 Research indicates those who prepare the majority of their meals at home have better health and fewer issues with weight management. Registered dietitians such as Dobies encourage individuals to eat healthier and more nutritious foods by individualizing their recommendations based on the person’s food or taste preferences, religious or cultural heritage, budget, health status, gender, age, and amount of physical activity. It is important to set goals that are S.M.A.R.T. (Specific, Measurable, Achievable, Realistic, and Timely). Achieving success means tracking your progress, being flexible, being willing to revise your goals, and rewarding yourself when you are successful. If you backslide, take it as a learning opportunity and move on. Dobies recommends setting specific, measurable goals. Also, keeping a food diary, vegetable tracker, or monitoring your intake on a nutrition app promotes better awareness and, ultimately, success. Resolving to Quit Smoking? We have tips! “Being flexible about your diet and food choices is linked with better overall health and weight management. It’s helpful to think about how a meal fits into your diet overall. If you are following healthy meal patterns most of the time, go ahead and treat yourself. An occasional indulgence can be good for the soul. When a setback occurs, it should not be viewed as a failure but as an opportunity to learn and review or revise your resolutions,” Dobies says. Read Alison Houck's Story about Journeying to Wellness. Read more from the issue here.